Before :- L. Narasimha Reddy, J.
C.R.P. No. 4630 of 2010. D/d. 7.10.2010. For the Petitioner :- Mr. V.R. Reddy Kovvuri, Counsel. A. Civil Procedure Code, 1908, order 16 Rule 14 and Rules 1 and 1-A - Court witness - Power to summon strangers to the suit as witnesses can be exercised by the Court on its own accord and not on the insistence of a party to the suit - If a party wants a particular individual to be summoned or examined as witness, it must have resolute to Rules 1 and 1-A of Order 16, C.P.C. 1. Ballabhdas Agarwala v. J.C. Chakravarty, AIR 1960 SC 576. 2. Gujarat Electricity Board v. Girdharlal Motilal, AIR 1969 SC 267. 3. Kosuru Kalinga Maharaju v. Kosuru Kaikamma, 2000 (2) ALT 409 : 1999 (6) ALD 789. 4. P.S. Chetty v. K.E. Reddy, 1988 (1) ALT 279. 5. Agha Mir Ahmad v. Mudassir Shaw, AIR (31) 1944 Privy Council 100. 6. Nazir Ahmad v. King Emperor, 1936 PC 253. 7. Varadharajan v. Saravanan, 2002 Tlmad-0-338 (The Laws). 8. Veesam Mohan Reddy v. Rebba Pedda Agaiah, 2008 (2) ALT 329. L. Narasimha Reddy, J. - The petitioner filed O.S.No.1198 of 2006 in the Court of the IV Additional Junior Civil Judge, Kadapa against respondent No.1 herein for the relief of declaration of title and perpetual injunction in respect of the suit schedule property. Thereafter, respondent No.1 got herself impleaded and made claim vis-a-vis the suit schedule property. Issues were framed and the trial of the suit commenced. 2. During the course of her evidence, respondent No.2 stated that the suit schedule property has accrued to her husband by way of exchange with Kadapa Zilla Parishad. In a way, she has projected independent title in respect of the property. 3. The petitioner filed I.A. No. 648 of 2010 under Rules 6, 7 and 14 of Order 16 C.P.C. with a prayer to summon the Chief Executive Officer of Kadapa Zilla Parishad as a witness to produce the records and documents mentioned therein and to speak about them. The application was opposed by the respondents. Through order, dated 22.09.2010, the trial Court dismissed the I.A. It was observed that Rule 14 of Order 16 C.P.C. does not confer right upon a party to require the Court to summon or examine a person as a Court witness. The same is challenged in this revision. 4. Sri V.R. Reddy Kovvuri, learned counsel for the petitioner, submits that though Rules 6 and 7 of Order 16 C.P.C. may not strictly apply to the facts of the case, it was competent, if not, obligatory for the trial Court to summon a witness on an application made by a party to the suit, in case, the necessity to summon the witness is established. 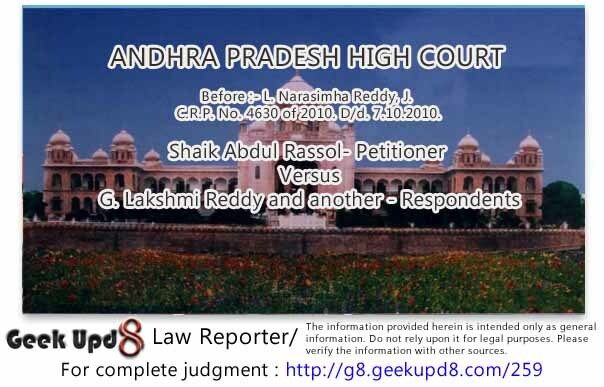 He contends that once respondent No.2 has stated that the suit schedule property stood transferred in favour of her husband on an exchange by Kadapa Zilla Parishad, verification of records maintained by it and the examination of the witnesses become necessary. Placing reliance upon the judgments rendered by this Court in Kosuru Kalinga Maharaju v. Kosuru Kaikamma, 2000 (2) ALT 409 = 1999 (6) ALD 789 and Veesam Mohan Reddy v. Rebba Pedda Agaiah, 2008 (2) ALT 329, the learned counsel submits that the view taken by the trial Court cannot be sustained in law. 5. The petitioner wanted the trial Court to examine the Chief Executive Officer of Kadapa Zilla Parishad as a witness, with reference to the records maintained by Zilla Parishad pertaining to the suit schedule property. He invoked Rules 6, 7 and 14 of Order 16 C.P.C. The trial Court rejected the application on the ground that it cannot be compelled to examine a person as a Court witness, and it is always for the Court itself to take such steps, on its own accord. 6. Order 16 C.P.C. deals with the summoning and attendance of witnesses. Rule 1 thereof mandates that the parties shall submit a list of witnesses, whom they propose to examine, to give evidence or to produce documents, within 15 days from the date on which the issues are settled. 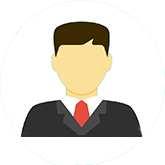 In case a party is of the view that it cannot procure the presence of a witness, whom he intends to examine, he can file an application for obtaining summons for ensuring attendance of such witness. Sub-rule (3) enables the Court to permit a party to call a witness, though his name does not appear in the list of witnesses mentioned in sub-rule (1), provided sufficient cause for omission is shown. Rule 1-A was added through amendment of the year 1976, enabling the parties to examine a witness without applying for summons under Rule 1. This, in brief, is the facility created for the parties to the suit in the matter of examining the witnesses. 7. Rule 6 of Order 16 C.P.C. enables a party to request the Court, to summon a person just to produce a document, without the necessity of any deposition. Rule 7 on the other hand empowers the Court to require a person, who is present in the Court, to give evidence or to produce documents, that are in his possession or power. Though the petitioner invoked these two Rules, none of them are relevant for the prayer made by him, in the I.A. Subject to the provisions of this Code as to attendance and appearance and to any law for the time being in force, where the Court at any time thinks it necessary to examine any person, including a party to the suit and not called as a witness by a party to the suit, the Court may, of its own motion, cause such person to be summoned as a witness to give evidence, or to produce any document in his possession, on a day to be appointed, and may examine him as a witness or require him to produce such document." The heading of the Rule makes it amply clear that the power to summon strangers to a suit, as witness is to be exercised by the Court "on its own accord". This idea is further strengthened by the phrases, "where the Court at any time thinks" and "the Court may, of its own motion", occurring in the body of the provision. This is not the case where the aid of heading is taken to expand or restrict the meaning of the provision. In fact, both are at harmony, with each other. "152. Amendment of judgments, decrees or orders: Clerical or arithmetical mistakes in judgments, decrees or orders or errors arising therein from any accidental slip or omission may at any time be corrected by the Court either of its own motion or on the application of any of the parties." "the plaint shall be rejected in the following cases". 11. Though it is not mentioned as to whether it is the exclusive prerogative of the Court to exercise such power, or whether it can be exercised at the instance of the parties; in practice, it is both. Much, therefore, would depend upon the text of the provision. Rule 14 of Order 16 C.P.C., permits of no doubt, as to its purport. It confers exclusive power upon the Court. The power can be exercised only when the Court feels to do so, irrespective of the stands, which the parties may take on the matter. 'Whether a Magistrate records any confession is a matter of duty and discretion and not of obligation. The rule which applies is a different and not less well recognized rule, viz., that where a power is given to do a certain thing in a certain way, the thing must be done in that way or not at all. Other methods of performance are necessarily forbidden'. "The Legislature has prescribed a mode for exercising of that power and hence that power can be exercised only in that manner and in no other manner." 14. The observations of the Privy Council and the Supreme Court are very much relevant in understanding the scope of Rule 6 of Order 16 C.P.C. To be precise, the Court must feel that notwithstanding the fact that the parties have adduced evidence, there are certain aspects which become necessary for effective adjudication of the dispute. It may be for the purpose of satisfying itself as to the legality of the claim even where the parties did not bestow the attention, or in relation to the facts, that have a bearing upon its very jurisdiction. The reason is that if the cause before the Court is such that it lacks the jurisdiction to adjudicate it, and the defendant in the suit or for that matter, the plaintiff did not bestow their attention to it, the very act of entertaining the suit; may become untenable. For this purpose, the court may choose to examine any person other than the witnesses that are already examined and enlighten itself, on some of the important aspects. This is only an example. The question of a party invoking such a power, which is to be exercised by the Court on its own accord, does not arise. 15. It now, needs, to be seen as to how this provision, was either interpreted or understood, over the years. "Order 16 Rule 14 CPC provides that the court may of its own initiative or suo motu cause any person to be examined as a witness though either of the parties did not choose to take steps for summoning such person as a witness. This power obviously intended in the interest of justice is aimed at clarifying certain situations and remove ambiguities and fill up lacuna and thereby further justice. The parties may refrain from summoning a crucial witness in the event of their apprehension of full fledged support and in such a situation the court may summon such person to give evidence to arrive at the correct factual picture and this witness is called a 'court witness'. Order 16 Rule 14 visualises the initiative by the court only to examine any person and it is for the court to consider of its own accord the necessity of invoking power under this rule without propulsion or application by the parties. The exercise of this power is in the nature of "self-starter" without extraneous pressure or pull." "It is true that the court is not obligated to invoke the power at the instance of the parties and the parties have no right to move an application under this rule. But however either of the parties can bring to the notice of the court the necessity for examining any person as court witness. On such application the court may scan the totality of facts and circumstances apart from the situations projected by the parties and arrive at an independent conclusion as to the necessity of a court witness. The parties are not totally barred from bringing to the notice of the court by application or otherwise and the court is not bound to take action on the averments or allegations contained in the application and it is the sole discretion of the court. The application by the parties may be considered as passing on the information so that the court may examine the issue indepth on the facts and circumstances set out in the application and other aspects." "A reading of the above provision would leave no doubt in the mind to say that either party to the suit proceedings can summon person including a party to the suit who is not called as a witness by a party to the suit, as a witness. Legislature has felt the need for a direct provision enabling the court to summon a party for giving evidence as a witness to help curbing the malpractice of a party not appearing as a witness and forcing the other party to call him as a witness, and adjudicate the issues properly. What is laid down in the above provision is that if the Court is satisfied about such a necessity to cause any person to be examined as a witness, Court can summon such person as a witness. The emphasis is laid on the subjective satisfaction of the Court. However, this power is to be exercised by the Courts guardedly and not as a matter of routine." "As could be seen, Order 16 Rule 14 of the Code of Civil Procedure empowers the Court to summon on its own any person to give evidence or to produce any document in his possession if the Court is satisfied that the evidence of such witness is necessary to arrive at a just conclusion. The said power includes to summon even a party to the proceeding. Though the language of Rule 14 shows that such discretion has to be exercised by the court at its own motion, the law is well-settled that such a power can be exercised even on an application made by a party to the proceedings, since the application if any, can be taken as an information to the Court." "I have considered this question carefully and am of opinion that it would be seriously detrimental to the defendants' case to admit this witness at this stage. I do not consider that it is the duty of the Court to remedy an omission by a party to the suit which may be intentional or if not, must be due to neglect." In the circumstances the Courts below were right in not acceding to the request of the appellants to examine Mt.Faruq, whether their omission to examine her was intentional or due to neglect. The power of the Court under Order 16, Rule 14, Civil P.C., to examine witnesses on its own motion is discretionary." 22. In Varadharajan v. Saravanan, 2002 Tlmad -0-338 (The Laws), the Madras High Court has this to say about Rule 14 of Order 16 C.P.C. "Para-7: Even in this rule, the power of the Court to examine the witnesses on his own motion, is discretionary. Ordinarily it is for the party to summon the witnesses necessary for his case and when the party has done everything in that regard, it is the duty of the Court to enforce their attendance. Only when it appears to the Court that the evidence of a particular witness is necessary for the proper adjudication of the suit, then only the Court may secure suo motu the attendance of such witness. This discretionary power under this Rule should not be used to help a party to tide over a real difficulty in examining that witnesses. When neither side has summoned the material witness to give evidence, the Curt is justified in refusing to call him as a Court witness after closure of evidence. Para-8: In fact, Rule 14 prior to amendment by the Amendment Act 1976, Court had power to summon as witnesses any person other than a party to the suit who had not been called as a witness by any party either to give evidence or to produce document. The Rule did not confer any express power on the Court to summon a party to the suit as a witness. But after the Amendment, 1976, the Court has been given express power to summon a party to the suit. Even if a party voluntarily appears in the witness-box to give evidence in his own favour and deliberately keeps himself away after examination-in-chief and before cross examination, the Court cannot exercise its power under the amended Rule also." 23. From the above discussion, what emerges is that, the power under Rule 14 of Order 16 C.P.C., is to be exercised by a Court, on its own accord, and not on the insistence by a party to the suit. Though a party to the suit can place any information, which may impress upon or convince the Court to exercise its powers under that provision, an independent application for that very purpose does not lie.If parties are permitted to make independent application for summoning of an individual as a Court witness and are conferred with the right to insist the Court to accede their request, it may lead to several complications. It can be used as a device to overcome their inability or failure to summon a witness, and in certain cases, to fill up the lacuna in the evidence, which is already on record. That was never the intention of the Parliament. If a party wants a particular individual be summoned or examined as witness, it must have recourse to Rules 1 and 1-A of Order 16 C.P.C. 24. The civil revision petition is accordingly dismissed. There shall be no order as to costs.